San Francisco’s $50 million, arts and culture-focused redevelopment of the Treasure Island neighborhood, a manmade island in San Francisco Bay, is moving along with the announcement of a star-studded shortlist of artists for its massive sculpture displays. Ai Weiwei, Hiroshi Sugimoto, New Jersey-based sculptor Chakaia Booker and five other artists have been invited to submit designs for three public sites across the development, from an initial pool of 495 entrants. The plan to expand the Treasure Island district will include the neighboring Yerba Buena Island, and add up to 8,500 new residences and 550,000 square feet of retail across both islands. The $50 million art budget, to be spent in the coming decades, will be generated through the 1% for Art in Private Development fund, which would levy a 1% “art tax” on new construction projects on the island. The three sites will include the Building 1 Plaza in front of the ferry landing, with a budget of $1 million, Waterfront Plaza, with a $2 million budget, and the Yerba Buena Hilltop Park, with a $2 million budget. Of the eight artists, only Weiwei and Booker have been invited to submit proposals for more than one site. Weiwei, Booker and Los Angeles-based Pae White, with Ned Kahn as a standby option, will submit for the Building 1 Plaza. Weiwei, British sculptor Antony Gormley, and Cuban artist Jorge Pardo will also propose pieces for the Waterfront Plaza, a likely future ferry terminal location. At the Yerba Buena Hilltop Park, which will offer sweeping views of Treasure Island once the development is complete, Booker, British sculptor and photography Andy Goldsworthy, and Sugimoto have been shortlisted. Once complete, the Treasure Island redevelopment, which will be jointly masterplanned by SOM and Perkins + Will, will only build on approximately 25 percent of the available land. By clustering new buildings along Treasure Island’s southern and western shores and building for density, the master plan not only reduces the island’s dependence on cars but will also provide plenty of space for the “art park” concept to unfold. CMG Landscape Architecture has been tapped to design the 300 acres of rolling parks across both islands. “It is anticipated that proposals will be submitted in the spring and will be placed on public view on Treasure Island as well as elsewhere in the city for comment and feedback before being voted upon by the Treasure Island Development Authority,” according to the San Francisco Arts Commission. Neither Weiwei nor Sugimoto are strangers to large-scale art installations, or integrating art with the built environment. Most recently, Weiwei's Good Fences Make Good Neighbors touched down in public areas throughout New York City, while Sugimoto was tapped to redesign the Hirshhorn Museum's lobby. The entire Treasure Island master plan can be read here. Despite being recently rebuffed as the potential site for the forthcoming MAD Architects–designed Lucas Museum of Narrative Art, San Francisco officials are moving ahead with plans to expand the city's sleepy Treasure Island district into a lively residential enclave and tourist destination. The city recently revealed plans to add a bevy of cultural institutions and up to 20,000 residents to the man-made island, which sits in the San Francisco Bay halfway between San Francisco and Oakland. The San Francisco Arts Commission has developed an arts-focused master plan for the island in conjunction with urban and architectural master plans developed by SOM and Perkins + Will. The plans, overseen by the Treasure Island Development Authority and the San Francisco Arts Commission, would see the island's public offerings expanded, beginning with a new series of public art installations. 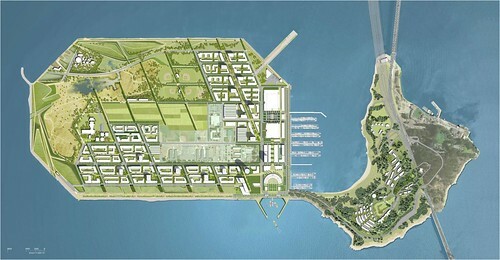 Eventually, the island—which is accessible only via its connection to Yerba Buena Island and the Bay Bridge—could add up to 8,500 new residential units and 550,000 square feet of commercial space. The island’s art program will be pursued using a projected $50 million fund generated by contributions made toward the city’s 1% for Art in Private Development fund as a result of the new development. According to a planning document released by the development authority, in the case of Treasure Island, the 1% for Art in Private Development funds will be applied toward the installation of public artworks on public lands. Generally speaking, the Treasure Island master plan, which includes the adjacent Yerba Buena Island in its scope, calls for leaving some 75% of the available land area free of development, with the remainder being plotted out as relatively dense mixed-use neighborhoods. The plan would focus on multi-modal complete streets designs in order to create a “network of parks and streets… [with] sunny, sheltered public space that is enlivened by artwork, buildings of enduring interest and active ground floor uses” while also reducing the island’s dependence on automobile traffic. The plan, according to the documents, would cluster development along the southern and western edges of the roughly rectangular island in a series of perimeter block formations. The project was selected in 2009 as one of 16 founding projects of the Climate Positive Development Program, part of the Clinton Foundation’s Clinton Climate Initiative grants supporting “climate positive” urban developments. For more information on the project, see the Treasure Island Development Authority website. The full plan is available here. Sixty-eight degrees happens to be the best angle for the streets in San Francisco's Treasure Island project, a utopian vision of green, pedestrian-centric living. The planners have realized that nobody will walk if they're buffeted by blasts of wind that sweep the island from the southwest, so they came up with a compromise that blocks wind while giving cars enough clearance to turn. It was just one of the interesting factoids that came up during yesterday's tour, organized by the AIA SF for their Architecture + the City Festival, going on right now (still time to catch one of the other tours and get in on the learning and schmoozing!). The main presenter, Karen Alschuler of Perkins+Will--who was involved with the project from the start, when it was just SMWM rather than the many firms in the mix today--gave a thorough presentation with a new aerial rendering: She painted a vision of how residents would commute to the city. "You'll be drinking your coffee at the kitchen window, and see the ferry leave from San Francisco, which takes about 13 minutes to arrive, and you'll walk down to catch it." All homes on the island will be designed so they are a 10 to 15 minute walk to the ferry building. But the really primo residential real estate will not be on the island itself, but on adjoining Yerba Buena Island. The west-facing half of the island will be redeveloped as part of the Treasure Island project, with a series of townhomes stepping down the hill, with truly amazing views. Anyone like me who has driven around and around Yerba Buena looking for a spot to take in that view and has been thwarted will be glad to hear there's going to be a new public park right at the top. That park's in addition to the 300 acres of open space on Treasure Island itself, which is only 400 acres altogether. To encourage fewer cars, the neighborhoods are built up densely around the ferry building. The current plan is to have retail and restaurants at the ferry terminal, and the hangar behind will be a farmer's marketplace (a la the Ferry Building). Besides Perkins+ Will, the team working on the master plan currently includes: CMG Landscape Architecture, SOM (condo tower), BCV (marketplace) and Page & Turnbull (historic restoration). Why so many cooks? The developer, Wilson Meany Sullivan, likes to encourage collaboration--and a little competition--to get the best results. Just joining the group is Seattle-based Mithun, which is working specifically on the neighborhood areas. Talking to Gerry Tierney of Perkins+Will, the plan for the 6,000-8,000 residences is to put parcels out to bid by developers, who will work with individual architects, in order to avoid an architectural monoculture. The design guidelines they are putting together will be "steadfastly modern"--definitely no historical pastiche. Their hopes are for something akin to the jolly Borneo Sporenburg in Amsterdam. On this brilliant day, where the city was so bright and clear, the vision seemed so close.